A recent study looked at the pros and cons of junior doctors (i.e. residents) using a hospital specific iPhone app. 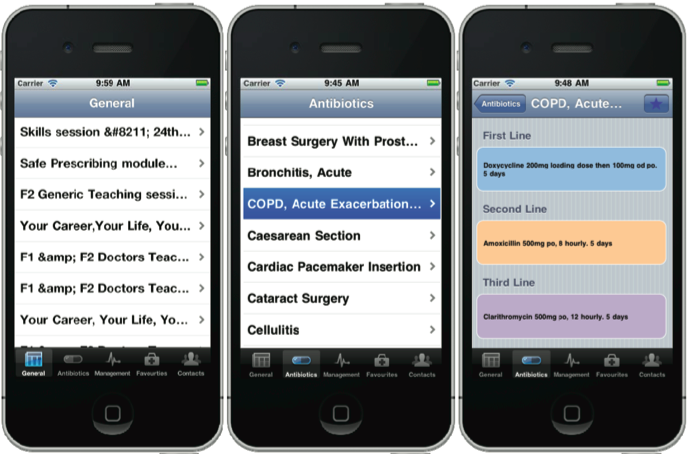 The app included general disease management and antibiotic use protocols that were specific to that hospital. In addition, there was an RSS feed for the post-graduate program, a favorites page, and a contacts page that had a hospital extension directory. There were 39 participants in the study in various fields (medicine, surgery, anesthesia, family among others), and they used their own iPhones. Results were based on pre/post-study surveys as well as post-study interviews. The majority of participants (76.9%) had medical apps installed on their iPhones prior to the study. 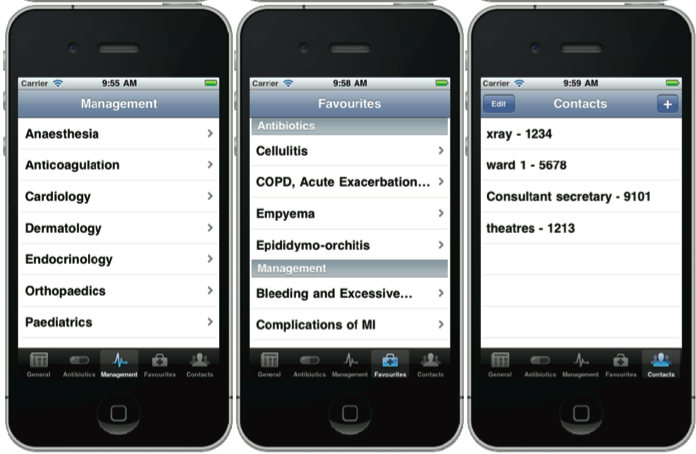 Of these, 66.7% use medical apps more than “rarely”. After the study, 67.7% of participants said that they saved time using the app, 74.2% looked at hospital protocols more frequently, and 45.2% believed the app had at least a moderate positive impact on patient care. It’s not surprising that a mobile app with important information would save time, increase how often the information was viewed, and improve patient care. The most interesting part of this study involved the interviews. They were broken up into 3 sections: barriers to smartphone use, where and when the app was used, and strategies for future app success. In general, the residents felt uncomfortable using the app in front of senior physicians as well as patients. They felt that they would be perceived as unprofessional as people might think that they are texting or making a phone call instead of using an app relevant to their patient’s care. This echoes an anecdotal example we presented last year — where medical students were getting in trouble for use mobile devices on the wards to look up disease pathology. The exception to this was in the emergency department where smartphone usage in practice was more widespread. There, smartphone usage for quick research was much more widely accepted as there wasn’t always time to go find a computer. As a result, the doctors were more comfortable using the app in “time-pressurized environments” such as in the emergency department or when they were on call and a computer wasn’t immediately available. Otherwise, when they were on the wards, they would generally use the app when they were sitting at a desk–if a computer was not immediately available. Therefore, it’s not surprising that the doctors felt that greater education about smartphone usage would make it easier for them to use the app more often. Particularly, they were interested in improving knowledge of what their phones could be used for. If senior colleagues and patients were more knowledgeable about smartphone relevant capabilities, they may be more comfortable with smartphone use. Additionally, they would like to see greater integration with the hospital’s computer system so that they could see patient data. They believed that further integration into the hospital system would further increase acceptance of smartphone usage. This study is only a preliminary one. Due to it’s small sample size, further studies are necessary to make the results truly applicable across a large scale. Specifically, the cultural issues associated with using a smartphone are likely to vary widely from place to place. The conclusions drawn are only relevant to this hospital. Beyond that — it would be interesting to see how these opinions would vary with faculty members of the hospital, as opposed to residents.